This is so much more than a story about a library cat. There's a very definite human aspect to it as well. 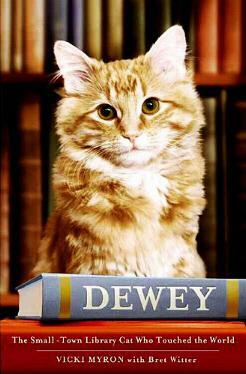 Dewey, the library cat, started his life in a rather bleak way. Library director Vicki Myron relates this moving story of how she found him, nursed him back to good health, and kept him in the Spencer, Iowa library. How he loved his life and how the people came to love him. How word spread around the world of his existence. The many patrons and even out-of-towners who came to visit with Dewey. Myron weaves her own life story with that of her beloved cat's, to make for more than just a few tears. I cried from the beginning of this book and on and off throughout. Being not only an animal-lover, but an emotional and empathic person, I was enthralled and moved by both their stories. I loved how Dewey interacted with children and adults alike, how he fitted in as easily as you please, his playfulness, and how much he touched people's hearts. Conclusion - A compelling and evocative read. Highly recommended, and this book totally deserves to be on the bestsellers' lists.